This annual conference at the Southwest College of Naturopathic Medicine in Tempe, Arizona, features some of the country’s most experienced herbal practitioners and teachers. Topics include botanical therapies for restoring gut health, cultivating focus & attention and treating musculoskeletal injuries. Includes botanical therapies for pain, inflammation, causes of CV disease, exposure to molds and mycotoxins, obesity and opiate withdrawal. Other lectures focus on the best harvesting and medicine-making techniques for essential oils, syrups and plant essences. Also includes these advanced therapeutic topics: Panel on immunotherapy and botanicals in cancer therapeutics; understanding aging; and managing neurological and cognitive decline (two-part intensive with Jason Miller, DACM, LAc). Full listing of all recordings below. 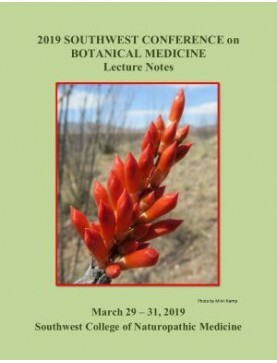 2019 Southwest Conference on Botanical Medicine: Conference Book.Order download of P..
Speaker: Mark Blumenthal. In this lecture, Mark describes the sources of botanical adulterants ..
Speaker: Jeffrey Langland, PhD. Great controversy still remains as to whether Echinacea pu..